Cherishing the Ladies on the High Seas- and City Winery! How It’s New York: Joanie Madden is a Yonkers gal, from the Bronx, and among her many awards she has a street named after her on the Grand Concourse, and has won the Ellis Island Medal of Honor. Her father Joe Madden was a beloved figure in New York too, and up in the Catskills. You’ll often see Joanie and some of the other Cherish ladies (Mary Coogan and Mirella Murray, I’m looking at you) around town, at gigs and sessions. I interviewed Joanie for the podcast when she did a Masters in Collaboration with Séamus Begley at Irish Arts Center: listen here. You can also read the review of the event (with some video) , and listen to Joanie singing lead on “Do You Love An Apple” here. How It’s Irish: Named or an Irish jig, Cherish the Ladies were one of the first all-female group of trad players (by no means the last; Girsa and Long Time Courting, I’m looking at you!). They play Irish music in a lively way, and have brought Irish music around the world (I’ve presented them in New Jersey at the Folk Project, and years ago when I lived in Alabama I left work early to see them play with a symphony orchestra in Columbus, Georgia). They’re playing City Winery on February 12, playing some tunes from their fab album Country Crossroads, which, as it sounds, has a little Nashville twang,the first time in Manhattan! What a loss to Irish music it would be if the Norwegian Pearl capsizes. 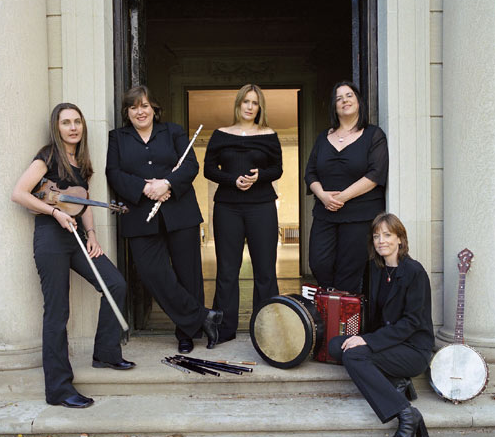 Not only Joanie Madden and Cherish the Ladies, but also Mary Black, Maura O’Connell, Celtic Cross, and Paul Keating, who runs Catskills Irish Arts Week – among others – are on board. Fortunately, Joanie laughs, although she’s sailed with the Italian captain who capsized his boat, this captain is Norwegian. Whew. So barring tidal waves, we can look forward to seeing Joanie and Cherish at City Winery on February 12th.So much in demand are Cherish around the world that although they are largely hometown girls, they don’t play in Manhattan that often. Sure you see them there-Joanie’s often appearing at 11th Street Bar’s session at 3am, livening it up. When I saw Maura O’Connell at City Winery, I was alone – my friend had something come up-and Joanie waved me over. City Winery, says Joanie, has taken the place of the Bottom Line – a comfortable, friendly place to see music (it also has, naturally, great wine, and good food). This cruise has been put together by Joanie, and she brought in an amazing line-up of musicians and friends.The ship sold out, which Joanie says is too bad because there were many people who couldn’t get cabins.She has about 1/4 of the ship, or nearly 600 people-three times more than she expected. But seriously, if you had the chance to go on a Celtic cruise in which Joanie was not only playing but also arranging the fun, wouldn’t you go?She has a big energy that makes people want to stay around her. In East Durham, during Catskills Irish Arts Week, she would come into Furlong’s Pub at 4am, as people were about to drift off. They’d change their minds. “What they should do is lock me out,” Joanie laughs (since Furlong’s has closed, she has the same effect at the Blackthorne. I left at 8:30 one night; she was chatting away at the bar, see this overview of the week). The band started not too far from City Winery, on Varick Street, on Spring Street. Their most recent album, Country Crossroads , celebrates 25 years, though on January 5 they celebrated their 27th anniversary. She, Grainne Murphy, Mary Coogan and Deirdre Connelly make their homes in New York (Kathleen Boyle does not). Not having to get on a plane and drive for hours afterwards is also a plus. The album, which came out in July, was recorded in Nashville, and includes some bluegrass and country players on it: Nanci Griffith; Vince Gill; Alison Brown on banjo, Dennis Crouch, bass player with T. Bone Burnette and Elton John; and Ron Ickes, the “dobro king.”Of course, there are fab Irish musicians too, including original band members Liz Carroll and Eileen Ivers; singer Deirdre Connelly; Maura O’Connell,;Jimmy Higgins on bodhran. The February concert at City Winery will mark the first time they’ve played tunes from the new album in Manhattan. But though there’s a little bluegrass flavor to it, “At the end of the day we get back on the only bike that we know, and that’s traditional music,” Joanie says. She plans to bring the show to Nashville one of these days. Of course, in 27 years the band has changed personnel. Joanie and guitar player Mary Coogan are original members of Cherish; Mirella Murray on accordion is in her tenth year with the band; Kathleen Boyle on piano is in her eighth year; Grainne Murphy is in her second year, and singer Deirdre Connelly has been doing a majority of the gigs. Has the band’s philosophy changed since they began? Joanie pauses to say she didn’t really have one – before citing that most successful Irish band, the Chieftains, who also played with symphonies and in performing arts centers and collaborated with all kinds of musicians. Mick Moloney put the band together in 1985 to do a couple of shows, “never dreaming this would ever become what it did,” Joanie laughs. There were always a handful of women in traditional music, but she remembers that when Mick launched the band, he did research on the Philadelphia irish musicians society.It had over 3200 members, and not one of them was a woman. The the first three Americans who won all-Ireland championships were women: Kathleen Collins, Eileen Ivers and Liz Carroll. Today, young girls often come backstage after shows. She got help from old timers, including tips from the Clancy Brothers, so it feels good to help bring young people along. She taught Kenny Vesey, whose father plays with Celtic Cross (who are on the cruise). Kenny recently won the All-Ireland on whistle. These days, they also write a lot of their own music, and Joanie even sometimes sings-mostly harmony. At City Winery, singer Don Stiffe will make a guest appearance too. The women in the band all come from different places, but Joanie says the have the same background – their dads played music. Kathleen Boyle grew up in Glasgow, but her dad was a musician from Donegal. Mirella Murray is from Connemara, but her dad was a great Seán Nós dancer. And they all grew up with the belief that music should be treated with respect. After the Caribbean cruise and a few gigs in February and March, the band goes to China in the spring. “We’ll keep going until the phone stops ringing,” she says. So offer a prayer for safety on the high seas.